"Earth Trek Borneo: The Terraformation Series – A Solo Exhibition of Ceramics by Martie Geiger-Ho" is a studio-based exhibition of ceramic vessels made from local clay found on the nearby location of Berakas Beach recreational park, Brunei Darussalam. My solo exhibition represents a body of work that will be finished for good because after the end of semester 2 of 2016-2017 I will be leaving Brunei. I am producing a limited edition of pots for an exhibition from a very limited source of local hand-dug clay. I did not start out thinking about my hand-built and thrown pieces from the last two years as being a limited edition "Terrafromation Series," but that is what this undertaking has become. This exhibition can be, through its material, connected to Brunei's creative industries. My exhibition is intended to be a teaching model for my ceramics teaching because I use pottery as a means for introducing the concept of using found clay, as opposed to processed commercial clay, to produce art. Furthermore, I accompany the limited-edition pots in my exhibition with a documentary video, showing the whole journey from collecting clay to the final fired ceramic vessel. Digital photographs showcasing the physical landscape and natural resources involved with gathering raw ceramic materials are also displayed. I consider all my exhibited vessels, to be experimental works because each object was fashioned from a small batch of hand gathered and prepared clay that yielded new and slightly different and unpredictable results. Also, instead of using commercially blended clay that would offer consistent results every time, I chose to work in a less predictable manner because I wanted to pay homage to the landscape that yielded the clay that was gathered one small bucketful at a time. By touching and experiencing each small landscape area that displayed a different kind of clay, I became familiar with the qualities of that place and then worked towards using my precious ceramic materials to their full advantage to make wheel-thrown vessels that resonate back to the character of their original location. This expains all of the work in my exhibition has a natural quality to it. Working with minimal stains and clay bodies is challenging but not really as limiting as I imagined it would be. My series of "Terraformed" pots has made me appreciate the raw tactile surface of the form more because that surface is what will communicate to the viewer. Naked pots can speak to the integrity of the earth materials from which they were fashioned. I do not want this work to have an ethnic look or display a simple a rustic appeal, because what I am seeking is a dialogue between my knowledge of Western throwing and sculpting and the personality of the small site-specific location of my hand-prospected clays. These days, when people ask me what I do for a living, I am inclined to answer that I am a gypsy professor and a potter. This means that I teach wherever I can find employment and that like a nomad, I carry the rudiments of my ceramics studio with me, while learning to make work from whatever materials my new environment provides. Situated at a general latitude of 4º30'N and longitude of 114º40'E on the island of Borneo, the tiny Sultanate of Brunei Darussalam is rumored to practically float on an underground oil reserve, that buoys up its economy currently based solely on this one industry. In conclusion, I believe that a greater understanding of pottery and the art of its production as a means of personal expression, can be better understood and appreciated if both collectors and makers of it, understand its relationship to its place of origin and its importance as part of the study of earth sciences and visual art. Perhaps one-day, ceramics can become one of the new forms of art in Brunei's long history of traditional art or craft forms that are an important part of Brunei Darussalam's creative industry. 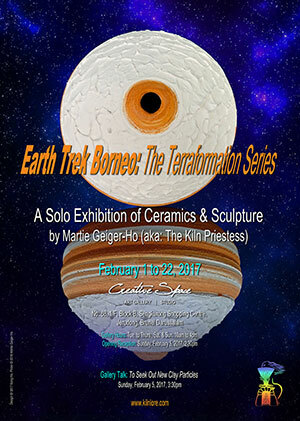 Earth Trek Borneo: The Terraformation Series - A Solo Exhibition of Ceramics & Sculpture by Martie Geiger-Ho, Creative Space, Brunei Darussalam, February 2017. 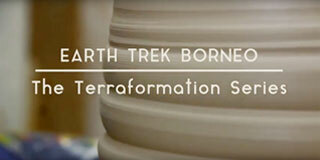 Earth Trek Borneo: The Terraformation Series,video producted by Creative Space, Brunei Darussalam.